Rent a low-cost, furnished apartment near downtown Albuquerque! Looking for an apartment in the the beautiful city of Albuquerque, New Mexico? Siegel Suites Albuquerque Apartments is the best choice in flexible stay living. Conveniently, we are just a short drive from the Downtown Albuquerque. Additionally, we are a short distance from several restaurants and shopping. Some of the restaurants include Panda Express, Olive Garden, Sadies of New Mexico and Applebee’s. Some of the shopping locations include Walmart, Target, Albertsons Market and Best Buy. Here at Siegel Suites Albuquerque, we rent fully furnished studio and one bedroom apartments that are move in ready. Want to bring your own bed or other furniture? No problem. We can quickly and easily remove what you want to bring. Rent your apartment today with bad credit ok and no long term lease required. Also, you will have a choice of low weekly or monthly payment options. Our low cost, pet friendly apartments are a great value. Each suite comes with free utilities, free cable TV, and more. Lastly, we have a sparkling pool for those warm summer months. Get more details below. Then call us toll-free at 1-888-328-0192, locally at 505-225-8902. You can, also, email us to reserve your apartment at Siegel Suites Albuquerque today. 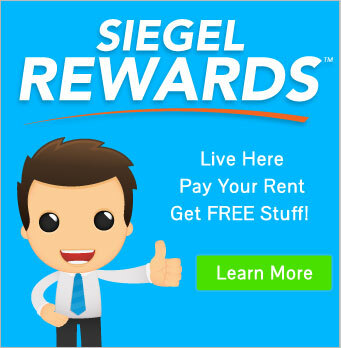 Also, another great feature of Siegel Suites is our Siegel Rewards Program. The longer you stay, the less you pay!